Halal Foods Booster is specially formulated, comprehensive supplement with Protein, Omega 3 DHA, Vitamins, Minerals, Carbohydrates and Probiotics for use during periods of study and mental work. It's comprehensive nutrition with DHA Omega 3 powers our Concentration, Learning, Memory, Alertness, Reflexes and Energy thus increasing one's capacity to learn and think which will lead to a proper development of the brain especially for school going kids. Packed with antiocidants to help reduce the harmful effects of free radicals and 24 vitamins and minerals to maintain good health in school going kids. 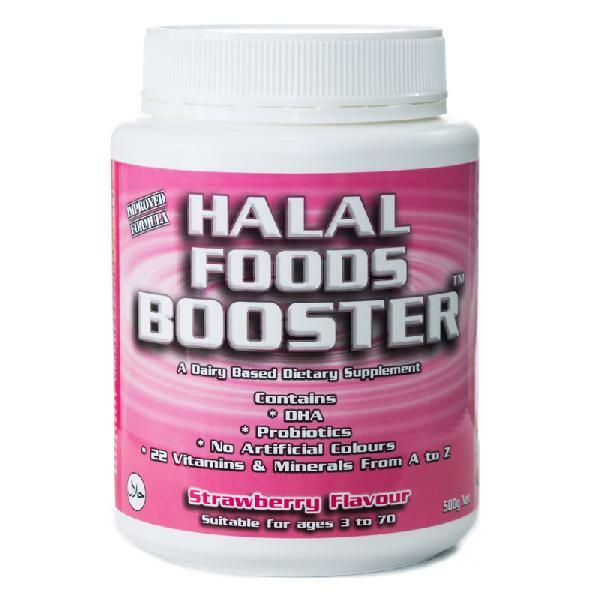 Looking for Halal Foods Booster Strawberry (Powder)?